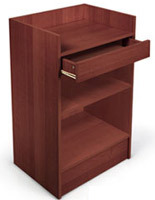 Create affordable retail store displays with this store display fixture! 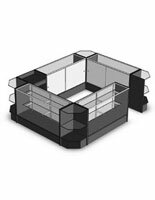 Our store display fixture is an ideal solution when furnishing your business on a budget. A cheap alternative to our Maple Veneer store fixtures, this store display fixture will give your business an upscale look without the hefty price tag. Our store display fixture provides an area where customers can peruse products without feeling hassled, but also allows them the freedom of asking questions as they arise. 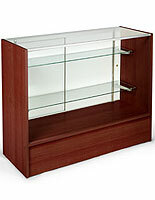 We sell this store display fixture complete with register stands and sales counters to make finding a store fixture that fits your retail display needs that much easier. With this store display fixture, also called a retail store display unit, you can store all of the necessary items for completing checkout transactions. 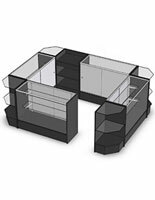 Each of the sales counters, corner display counters and display showcases in these retail displays come with adjustable, tempered glass shelving. 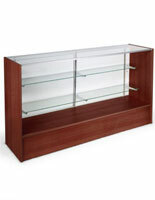 This way you can adjust the height of the shelves to accommodate larger or smaller merchandise. This store display fixture consists of one 24" checkout counters, four 48" store display counters, and four corner counters. 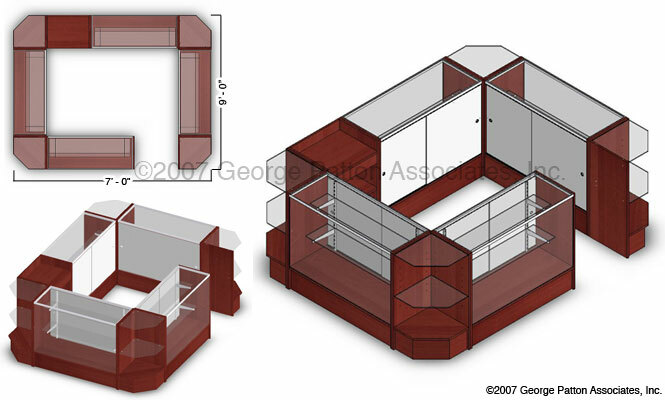 Each of the pieces feature cherry melamine panels, tempered glass panels, hardboard sliding doors, and an aluminum frame. Perfect for shopping malls, department or jewelry stores, this store display fixture will give your retail store an upscale appeal. 84.0" x 38.0" x 108.0"